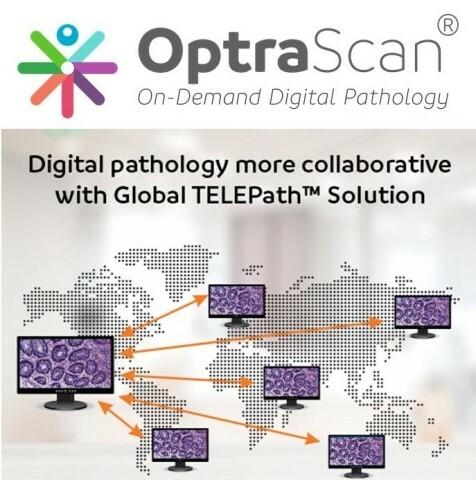 OptraSCAN® Inc., global digital pathology solutions provider, and Neuberg Diagnostics, one of the Top 4 Diagnostics Service Provider in India, today announced the launch of Global TELEPath™ Network for the pathologist community in UAE, India and South Africa under a new partnership namely, “Neuberg DIGIPATH, Powered by OptraSCAN® Inc.” at Medlab 2019, Dubai. “With OptraSCAN’s expertise in providing new-age technology that are well-equipped with AI & ML based analysis tools, the newly combined collaboration will enable us to expand the service as well as the geographic reach of Neuberg's existing lab services. We expect the economies of scale from this partnership to help us bring better value to our clients and expand our service offerings,” said Dr. GSK Velu, Founder & Chairman, Neuberg Diagnostics. An ISO 13485 certified company and CE marked whole slide scanners for IVD use, OptraSCAN® has developed world’s first ‘On-Demand Digital Pathology’ System; focused on delivering fully integrated, affordable systems & solutions. These serve as the perfect tool for transition from conventional microscopy to Digital Pathology for the effective acquisition of whole slide images, viewing, storing, real time sharing, and reporting via On-Demand or outright purchase model. Follow Us on LinkedIn and Twitter.